How do you get high-schoolers to care about nutrition? Sydney Miller, a 15-year-old sophomore at Broadneck High School in Annapolis, lost more than 30 pounds after switching to a vegan diet and giving up all processed foods last year. She also helped her dad, Todd Miller, lose weight. BeeQuest is a key element of a youth-focused nutrition study called NutriBee, created by Ingrid Kohlstadt, a doctor at the Johns Hopkins Bloomberg School of Public Health. The goal of the study is to figure out how to get children between the ages of 10 and 12 interested in nutrition, she says. NutriBee includes a 20-hour nutrition curriculum that’s mostly used in after-school clubs and camps, particularly for disadvantaged students. The BeeQuest competition gets high-schoolers involved, by asking them to create fun online lessons that appeal to their slightly younger peers. Contestants must link their interest in nutrition with topics they care about, such as pottery, music or computer programming . Each project has a picture and biography of the creator and a quiz in the form of “BeeQuestions.” Many have short videos. The presentations are free and available to the public online, at nutribee.org/beequest. Sydney entered the BeeQuest competition with a PowerPoint about packaging waste in grocery stores. Her video was one of 19 chosen in 2013 and 2014 to educate middle-school students about eating well. The winning students are from 12 states, with eight from Maryland. The competition is currently collecting PowerPoint presentations for BeeQuest 2015. Jillian Parisi, 14, a freshman at Severna Park High School, loves to make things out of clay, so for her project she created a porous bowl that keeps fruit fresh. She learned that plastic containers trap gases emitted by ripening fruit, speeding the transition from ripe to rotten. Her stackable pottery, with holes for water drainage, is attractive enough to sit on a kitchen counter, encouraging snackers to reach for fresh fruit, she says. Cameron Moye, a 16-year-old sophomore at Kent Island High School in Stevensville, created a BeeQuest project called “Sound Bites,” using kitchen utensils as musical instruments. “Since I’m in a band, I’m already musically involved, so I thought it would be neat to do something with music,” he says. Mary Koger, who lives in Severna Park and is a freshman at Arcadia University in Pennsylvania, is interested in a career as a scientific illustrator. She worked on her BeeQuest project about pet nutrition for about six months, says her mother, Ann-Marie Koger, illustrating her PowerPoint slides instead of using photographs. “Mary is really passionate about animals and animal care,” says Ann-Marie Koger. Sydney’s presentation challenges viewers to grocery-shop in a way that reduces packaging waste. “We need to do what we can now to keep our Earth clean and livable before it is too late,” she explains. Her project is a grocery store scavenger hunt seeking ingredients for her stuffed-avocado recipe. The goal is to choose items with the least amount of packaging, and “in the end, you decide where all the waste goes, recycling, compost or landfill,” she says. For more information on BeeQuest, go to nutribee.org. As classrooms “go digital,” educators should consider smell and taste as underutilized teaching tools, especially for teaching kids nutrition. There’s strong evidence for smell and taste being central to nutrition education dating back a century to the pioneering work of physician Maria Montessori, whose schools worldwide continue to prioritize what Dr. Montessori referred to as the “education of the senses.” There is also recent evidence that multisensory nutrition education reduces classroom absenteeism and improves standardized test scores, according to a report by the Institute of Medicine’s task force on childhood obesity. Changes in health behaviors, such as hand washing, hydration and reducing sugar intake, lead to fewer sick days. And activities such as cooking with recipes, reading nutrition labels and counting calories appear to greatly improve math test scores, possibly because they utilize more senses than does most math classwork. There’s a biochemical basis for incorporating taste and smell into nutrition education. Taste and smell, which are referred to as the chemosenses because they “talk” to the brain via molecules, guide our behavior and level of motivation. Studies using functional MRI map chemosensory brain activity in the brainstem, a control center for instinctual behaviors like sleeping, eating and the fight-and-flight response. (In contrast, sight and sound are largely registered in the neocortex, the part of the brain used for cognition.) Food scents and taste are powerful influencers because of food’s central role in species survival. The gaming and cosmetic industries use food fragrances to incentivize behavior and purchases. In other words, the nose knows–less in the test-taking way we usually assess knowledge and more through pathways linked closely to behavior change and lifelong learning. Chemosensory learning does not stop in elementary school. In fact, taste acquisition and adult food preferences are honed during early adolescence. The case for incorporating chemosensory learning into middle and high school curricula has never been stronger. The sophistication of fast food marketing requires today’s youth to be especially discerning. Children and teens also have more discretionary spending and a wider array of food choices. Given the epidemic of nutrition-related chronic diseases, we need an all-hands-on-deck approach to equipping our nation’s youth. A rise in chronic diseases in youth has led to a rise in the use of prescription medications to treat them. One in 4 insured American youth takes a prescription medication on a regular basis, according to the Medco 2010 Drug Trend Report. Many of these medications have not been studied in youth, and those that have been studied exhibit nuanced, individualized and sometimes adverse effects on food selection and appetite. Appetite-related side effects are not limited to the medication’s duration and can be long-lasting. However, teaching kids to fine-tune their senses of smell and taste can minimize these side effects by helping people realize when they’re full, and is also key to mindful eating. Community partnerships have long been a way for public health nutritionists and educators to work together to achieve sustainable behavior change among youth. The web has also become a catalyst for more diverse stakeholders in nutrition education: STEM programs using nutrition as a gateway science, athletic groups seeking to improve the sports performance of youth, agriculture programs such as 4-H and Future Farmers of America, and the National Park Service linking healthy parks with healthy people for their upcoming centennial. Peer leadership is another well-established method for engaging adolescents in positive health behaviors. The web and social media have allowed youth peer leaders to expand beyond traditional roles such as camp leaders, afterschool tutors and buddy program participants. In NutriBee, an early adolescent nutrition intervention I researched and developed at Johns Hopkins, high school students come up with projects relating their personal interests to nutrition, which then comprise the online component of NutriBee’s curriculum. The curriculum, aimed at slightly younger kids, incorporates the chemosenses, touch and social interaction. 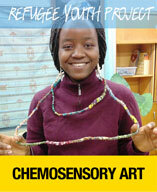 The chemosenses can help translate nutrition education into healthful behavior changes and positive actions. Getting taste and smell back into the teaching toolbox can therefore impact public health. And the digital age is fertile soil for sprouting the innovation necessary to do that. Ingrid Kohlstadt, MD, MPH, is a physician graduate of Johns Hopkins School of Medicine. Dr. Kohlstadt is a Faculty Associate at Johns Hopkins University Bloomberg School of Public Health and double-board certified in preventive medicine and nutrition. She edited textbooks Food and Nutrients in Disease Management and Advancing Medicine with Food and Nutrients, Second Edition. Dr. Kohlstadt has worked for the CDC, the FDA, the USDA, the Indian Health Service and the Johns Hopkins Weight Management Center, and serves on the review board of Nutrition Journal.